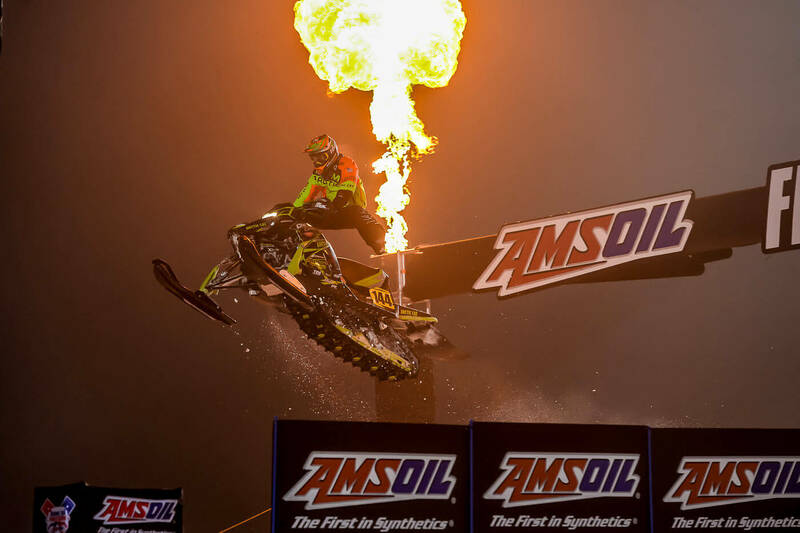 Arctic Cat fans can finally exhale. After Tucker Hibbert retired last spring, the legion of green followers was wondering which of the company’s young riders was going to step up and be their next great champion. Team Arctic’s Daniel Benham has taken on the load of lead ambassador this season, and turned in a dominant performance in Mt. Pleasant, Mich. on Saturday night. 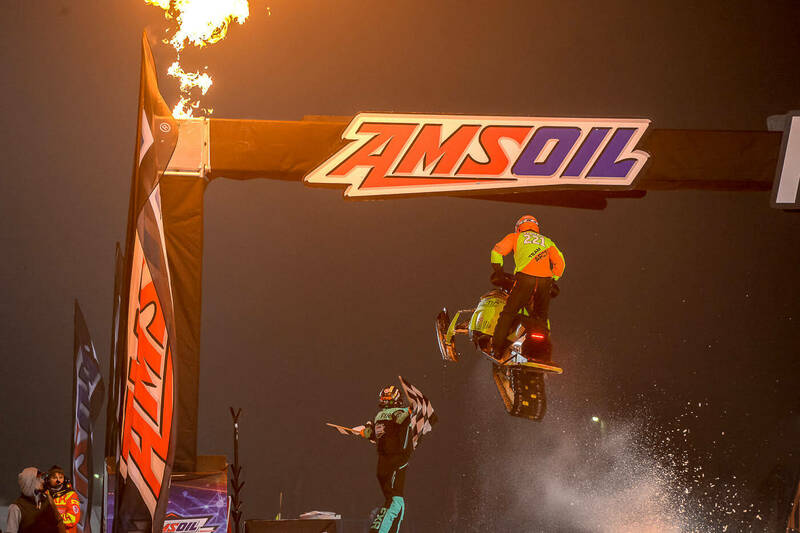 Benham has been streaky in his rookie year on the pro circuit of AMSOIL Championship Snocross, POWERED by RAM. He has three heat race wins and a pair of fourth place finishes. He has led races and been in podium position in several others. As other rookies, and even some veterans, picked up their first career wins this year, the reigning Pro Lite champion was still looking to fill a spot on the box. At round ten, the streakiness continued as Benham had to win the LCQ to get into the final. From there, he railed the #221 from the outside and into a first lap lead, one he wouldn’t relinquish during the 16-lap main. While Benham went wire-to-wire for his first career win, points leader Elias Ishoel did everything in his power to keep him honest. 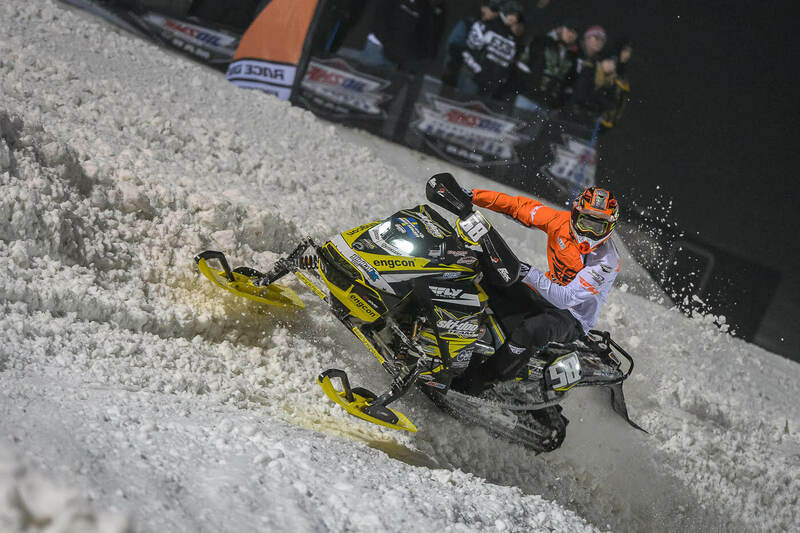 After starting seventh, the Ski Doo driver systematically worked his way up to the leader, applying pressure until Benham pulled away over the past few laps. 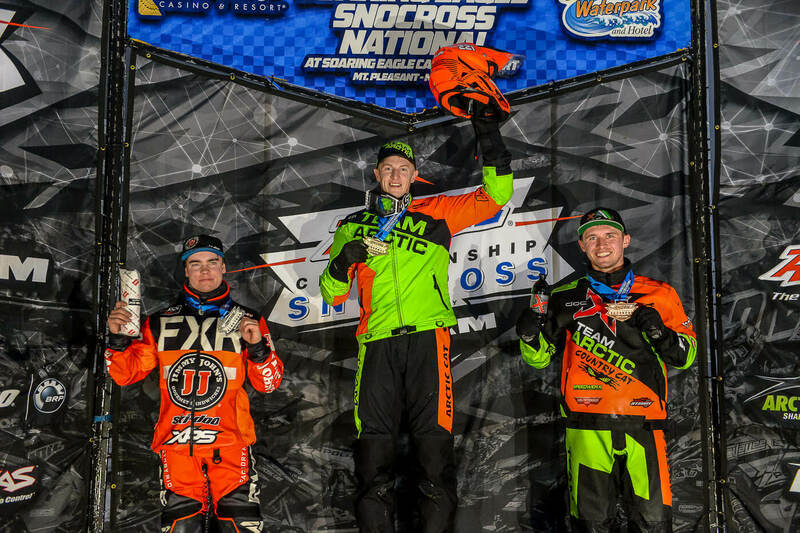 For the second weekend in a row, Arctic Cat’s Logan Christian worked his tail off for a podium finish. Christian started up front with Benham but dropped down to sixth before storming back and taking over the third spot with five laps to go. 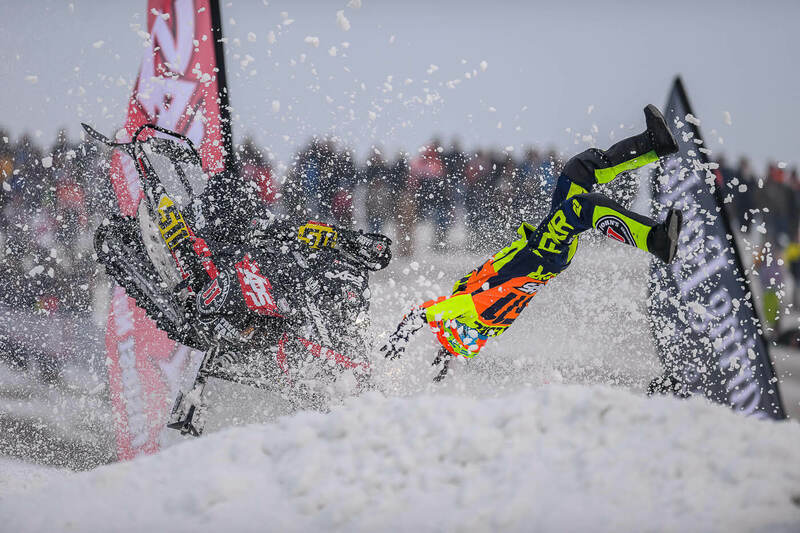 Polaris rider Kody Kamm finished fourth, and Ski Doo’s Aki Pihlaja rounded out the top five one night after having a huge crash that catapulted him off his sled. 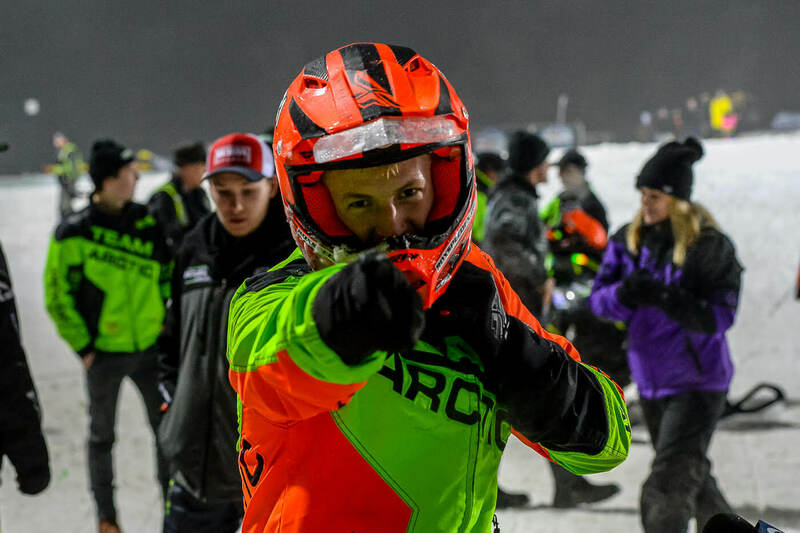 Of note was the absence of Ski Doo’s Lincoln Lemieux, who came into the weekend tied for second overall, but missed his second night of racing as he dealt with a shoulder issue. 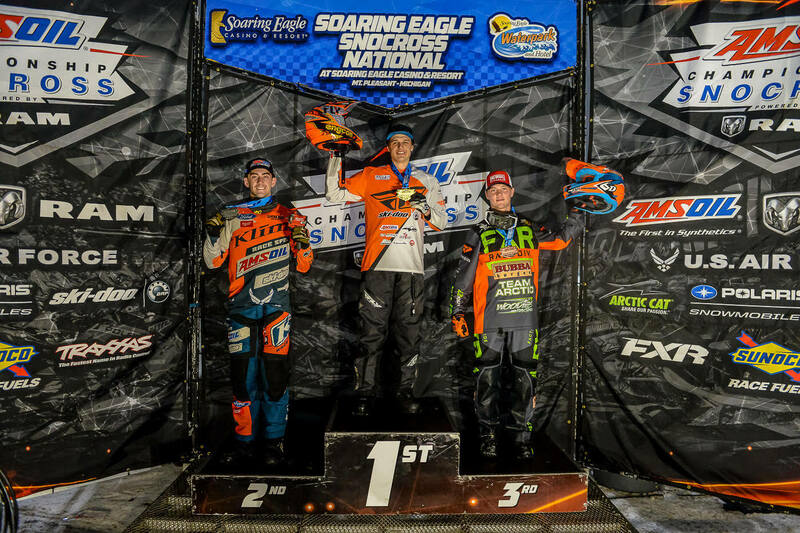 As the national circuit steamed towards Michigan, it brought with it an extremely competitive Pro Lite class. Six different riders, representing all three brands, had notched a victory in the first eight rounds of racing. To top it off, all six entered the season with zero combined wins in the class. With that much parity early on, there can’t possibly be another first-time winner left in the field, right? 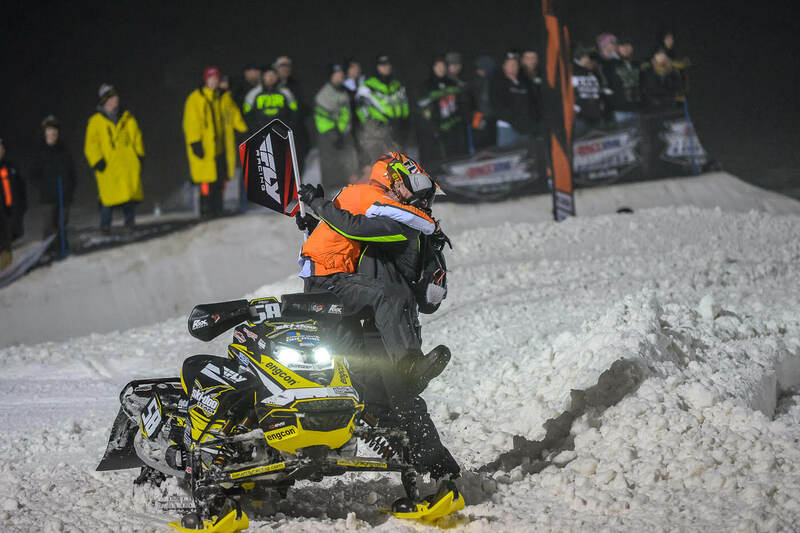 Enter Ski Doo’s Marcus Ogemar who despite not having a podium this year, was the best rider on the track on Saturday night. Ogemar has been racing on the national for the past four years and is finally seeing the fruits of his labor. The former World Champion quietly made his way into third overall thanks to five heat race wins, including one on Saturday night. In the final, the Swedish rider worked his way from a third-place start and into the lead on lap three when he got around points leader Francis Pelletier. At that point, Ogemar was in control, found his rhythm and started stretching out his lead for his first career Pro Lite win. Friday nights winner Hunter Patenaude couldn’t get his winning streak up to three, but a pair of heat wins on Saturday and runner-up to Ogemar helped the Scheuring Speed Sports rider close the gap on Pelletier in the championship chase. Pelletier had a mechanical during the final, giving him a DNF for the night, and what was a 31-point lead on Friday morning, is now just four points. Deadwood winner Nisse Kjellstrom finished third in Michigan. Megan Brodeur got back in the winner’s circle in Michigan, as the Pro AM Women’s points leader went from third to first to pick up her sixth win of the year. Melane Andersen continued her mid-season surge, finishing second ahead of Taven Woodie. Andersen and Woodie are now tied for second in the championship standings. The year-long battle for supremacy in Pro 30 Plus looks like it will go down to the end this year. Zach Pattyn and Matt Pichner went 1-2 at Mt. Pleasant, giving Pattyn a three point lead over Pichner. 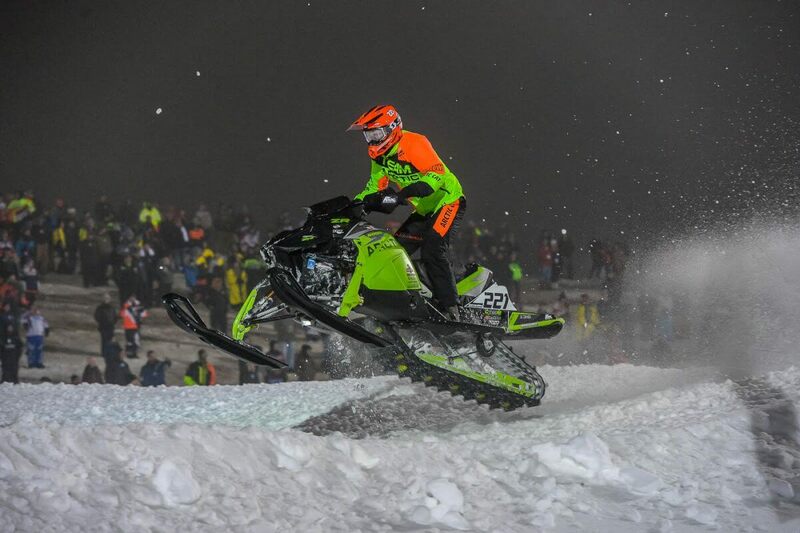 Cody Matechuk went back-to-back in Michigan in SnowBike. The X Games gold medalist won by 12.5 seconds over Jesse Kirchmeyer on Saturday night. Jordan Lebel had won three straight, but a rough crash and then a late charge by Drew Freeland ended his streak. Freeland crossed the AMSOIL finish line just .884 seconds ahead of Lebel for his first Sport Lite win. Lebel did get the best of Freeland in Jr. 14-15. It was Lebel’s third win and fifth podium in the class this season. 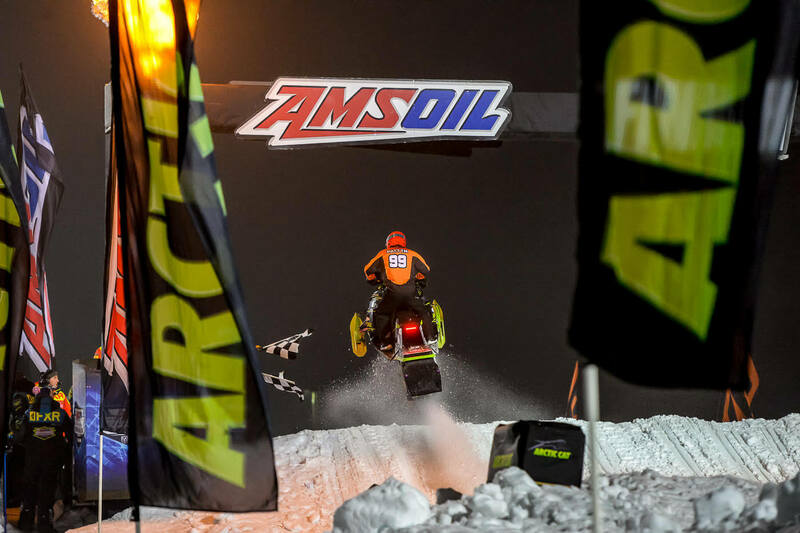 Arctic Cat’s Anson Scheele won his first Sport final with a wire-to-wire effort. Beau Tibbetts and Samuel Blouin rounded out the podium. Kellen Chapuran has now won all five national Transition 9-13 and all five Jr. 10-13 events this season. Dylan Lebel took the lead over Gavin Oldefendt with two laps to go to win his fourth national Transition 8-10 final.